Horse racing matched betting tips, a guide to maximising your profits! Horse racing for matched betting is a lot trickier than doing football matched betting. The reason for this is purely due to the volatility in the odds right before a horse race actually begins. About 5 minutes before the race is actually due to go off is where the odds on both the bookmakers and the exchanges are most volatile. This makes it very hard to be able to place bets on both the bookmaker site and the exchange safely and in time. In this horse racing matched betting tips article I aim to provide tips on how to get on horse racing bets quickly and safely. Always avoid placing bets 5 minutes before a race starts. If you keep staring at screens in this time period, you will be tempted to “risk it” and jump on quickly at the bookmaker but before you know it the odds have changed significantly on the exchange and then you won’t be able to get on at all at the exchange. If you back the horse at 4.0 at the bookmaker site, then the odds are 4.1 when you have place the bookmaker bet, the lay odds could very easily alter to 4.5 or higher in a matter of seconds, then by time you try to place the lay bet at 4.5, the lay odds have drifted further to 5.0. The odds are moving extremely fast and you could end up with no lay bet placed at all. I call this time period the “danger zone” purely because the odds are at their most volatile and it is more risky to place a back and lay bet in enough time at the desired odds. Place bets ideally an hour before the race itself starts. This ensures you have allowed enough time for the odds between the bookmaker and the exchange to become closer to each other. Trying to do this early in the morning will see not much liquidity in the exchange markets and therefore the lay odds will be much wider than the bookmaker back odds. This will improve as the time of the race becomes nearer. An hour before is optimum as the odds are more stable and less likely to change quickly as they would do 5 minutes before the race actually starts. Use the Oddsmatcher software at Oddsmonkey. This will do all the hard work for you by finding you a match where the qualifying losses will be kept to a minimum and profits will be as high as possible. You can let the Oddsmatcher find you a match tailored to your requirements so if you need a horse to be at odds of 5.0 or higher you can filter the software to find you horses above these odds. This will save you a lot of time and effort in the long run so it is worth paying the small monthly fee to use their excellent software. I do it and it saves me hours of time each month as well as minimising my losses and maximising my profits so it is totally worth your while using their software. A second of time in the horse racing markets can very quickly feel like a lifetime when you are watching the odds move so having the best resources to hand is crucial and the Oddsmatcher at Oddsmonkey is one of those resources. Be prepared. Before you even consider placing a bet on the bookmaker site, make sure you have the liability in the exchange before you click “place bet” at the bookmakers. If you don’t have enough cash to lay the bet off successfully, you will end up at a loss if the horse ends up losing the race. So make sure that your bankroll can handle the liability in advance before you even load up your bookie account, deposit and actually place the bet. If you need £400 in your exchange, make sure it is there already before you place your bet at the bookies. This will save you a lot of heartache if you can’t fully place your lay bet at the exchange. Ensure you know the full terms of the offer you are attempting. This is more important when you are doing an each way bet because if there are less than a certain number of horses in the field, you may find you won’t be paid out the correct odds. On Oddsmonkey they have software called the each way matcher and it will always appear in red if you are attempting an each way arbitrage bet with potential for a race to have not enough horses in the field. Always ensure you are backing at the minimum odds of an offer at the bookmaker site and you enter the information correctly into the matched betting calculator or any other of Oddsmonkey’s fantastic software on their site. The biggest challenge with horse racing is the volatility of the odds before the race actually starts. You can combat this by placing your bets well in advance of the horse race actually starting. Never attempt to bet on a horse literally seconds before the race is about to start as the odds volatility make is almost impossible to back and lay your horse safely. If you are betting in this period, you are essentially gambling by hoping the odds become more stable; I can tell you that they won’t become stable from my own experience in this time period. This article shows my 5 top tips to make sure you find success and reduce risk in the horse racing betting markets at both the bookmakers and the exchanges. The whole point of matched betting is to be risk free and following these tips you will reduce your risk even further. Using a service like Oddsmonkey is also beneficial as they have all the software you could possibly need to place bets on horse racing as effectively as possible. 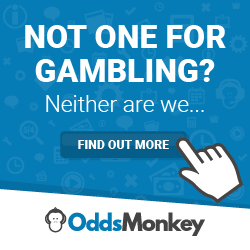 I use Oddsmonkey and pay them the same monthly fee as everyone else so I know firsthand how valuable their service is for someone who is willing to start matched betting. Some good tips thanks, enjoying your videos, I would add to your tips advising placing the back (bookie) bet first, it’s safer i.e. less risk than placing lay (exchange) as exposure is normally higher at the exchange., especially if odds are high. If you stick to your rule #2 should be ok, but sometimes there are problems getting both bets on. Thanks David. Yes it is always important to place your back bets first to prevent the difficulty of placing your lay bet if the odds change.